Officials from Palomar College and San Marcos Unified School District (SMUSD) are shown celebrating the establishment of The Palomar Promise, which will provide eligible SMSUSD graduates with free tuition while attending Palomar College. From left are (standing) Palomar College Foundation Executive Director Richard Talmo, Herbie Smith, Executive Director, San Marcos Promise, (sitting) Palomar College Interim Superintendent/President Adrian Gonzales and SMUSD Superintendent Dr. Kevin Holt. 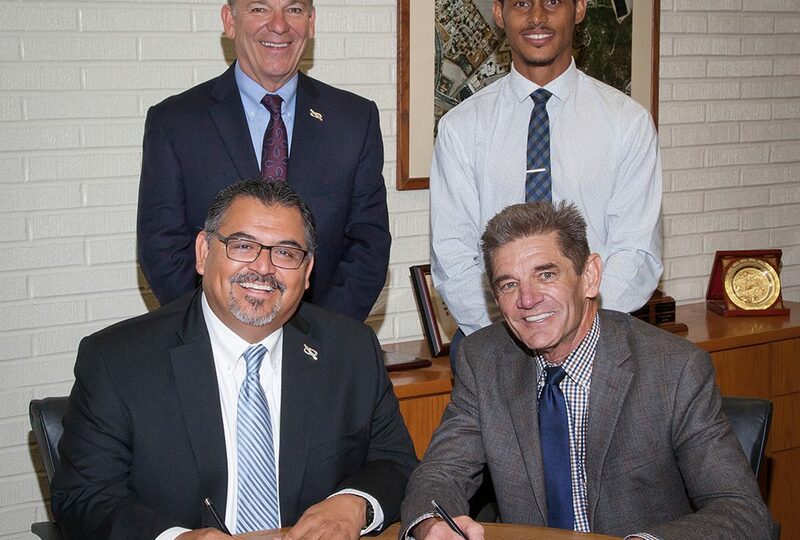 SAN MARCOS, CA (June 21, 2016) – The Palomar Community College District Governing Board has approved a memorandum of understanding (MOU) between Palomar College, The Palomar College Foundation, San Marcos Unified School District and The San Marcos Promise to create The Palomar Promise, designed to provide all eligible SMUSD graduating high school students with free tuition for up to two years while pursuing an associate’s degree, transfer requirements, and/or a certificate program.